The archaic Dutch word staten originally related to the feudal classes ("estates", or standen in Dutch) in which medieval European societies were stratified; the clergy, the nobility and the commons. The word eventually came to mean the political body in which the respective estates were represented. Each province in the Habsburg Netherlands had its own staten. These representative bodies (and not their constituent estates) in turn were represented in the assembly that came to be known as Staten-Generaal (a plurale tantum), or Algemene Staten (General States). :5–15 The English word "states" may have a similar meaning as the Dutch word staten, as in e.g. States of Jersey. The English phrases "States General" is probably a literal translation of the Dutch word. Historically, the same term was used for the name of other national legislatures as, for example, the Catalan and Valencian Generalitat and the Estates General of France during the Ancien Régime. Several geographic place names are derived from the States General. In 1609, Henry Hudson established Dutch trade in Staten Island, New York City and named the island Staaten Eylandt after the States General. Isla de los Estados, now an Argentine island, was also named after this institution, the Spanish name being a translation of the Dutch name. Abel Tasman originally gave the name Staten Landt to what would become New Zealand. Staaten River is a river in the Cape York Peninsula, Australia. The Great Assembly of the States General in 1651. At the start of the Dutch Revolt the States General (who were then not continually in session) remained loyal to the overlord of the Habsburg Netherlands, Philip II of Spain (who did not have the title of King in the Netherlands, but held the title of duke and count in the several provinces). In 1576 the States General as a whole, however, openly rebelled against the Spanish crown. In 1579 the States General split as a number of southern provinces, united in the Union of Arras returned to obedience, while other provinces, united in the Union of Utrecht continued the rebellion. :260–268,288–296 After the Act of Abjuration in 1581 the northern States General replaced Philip II as the supreme authority of the northern Netherlands, which then became known as the United Provinces. This was a confederation in which most government functions remained with the provincial States (and local authorities, like the Vroedschappen). These delegated representatives to the States General as a kind of ambassadors acting with a mandate limited by instruction and obligatory consultation (last en ruggespraak). The States General, in which the voting was by province, each of the seven provinces having one vote, took on many executive functions after the Council of State of the Netherlands had temporarily come under English influence, due to the Treaty of Nonsuch. :305–315:293–294 The States General for this reason since 1593 remained continually in session until their dissolution in 1795. The presidency rotated weekly among the senior representatives of the provinces. Under the Union of Utrecht treaty the States General formally was the sovereign power, representing the Republic in foreign affairs and making treaties with foreign monarchs. :292–293 As such the honorific title of the States General collectively was Hoogmogende Heren (mightiest, or very mighty, lords). Due to the vagaries of the Eighty Years' War in which territories were lost and (partially) reconquered, not all territories that had originally signed up for the Union of Utrecht remained represented in the States General. The States of Brabant and of Flanders lost their representation after 1587 as most of their territory had been conquered by the Army of Flanders, and it was not restored after part of that territory (together with parts of the Duchy of Limburg) was reconquered by the Dutch Republic. The Drenthe territory was never directly represented in the States General. Twenty per cent of the new Republic's territory, known as the Generality Lands, was so under the direct rule of the Generality (generaliteit). :297–300 The Dutch East India Company and the Dutch West India Company were also under its general supervision; for this reason Staten Island in New York City (originally New Amsterdam) and Staten Island, Argentina (Discovered by Dutchman Jacob le Maire), are among places named after the Staten-Generaal. The States General in both The Hague and Brussels came to an end after 1795; the South was annexed by France, and the North saw the proclamation of the Batavian Republic and the subsequent convocation of the National Assembly (1 March 1796). The States General meets in joint session at least once a year, at the opening of the parliamentary year, when the king gives his Speech from the Throne on Prince's Day. On special occasions, such as when a States Generate vote on a marriage of a member of the royal house, an inauguration of the monarch, or the death of a member of the royal house, both houses also meet in a joint session (Verenigde Vergadering), with the President of the Senate presiding. They take place in the Ridderzaal (Hall of Knights) in the Binnenhof, except for the inauguration of the monarch, which occurs in the Nieuwe Kerk in Amsterdam. The rest of the time, the two chambers sit separately. 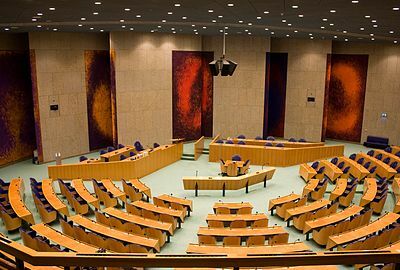 Constitutionally, all functions of the parliament are given to both houses, except for the rights of initiative and amendment, which only the Tweede Kamer has. The Joint Session also appoints the monarch if there is no heir to the throne and the regent is unable to exercise his or her powers. An important question is whether the relationship between cabinet and parliament should be dualistic or monistic. That is, whether ministers and leaders of governing parliamentary parties should prepare important political decisions. According to the dualistic position, members of parliament of governing parties should remain independent of the cabinet. The term 'monism' is used to refer to a stance that important decisions should be prepared by the people of the governing coalition in order to promote political stability. Edmundson, George (1911). "Netherlands" . In Chisholm, Hugh (ed.). Encyclopædia Britannica. 19 (11th ed.). Cambridge University Press. pp. 413–421. ^ a b c d e f g Koenigsberger, H.G. (2001). Monarchies, States Generals and Parliaments: The Netherlands in the Fifteenth and Sixteenth Centuries. Cambridge U.P. ^ In treaties, such as the Treaty of Westminster (1654), the States General were called:"Celsos Potentesque Dominos Ordines Generales Foederatarum Belgii Provinciarum", or "High and Mighty Lords States General of the united Netherlands' Provinces", where ordines corresponds with "states." ^ Martin, Kimberly. "The Political Institutions of the Dutch Republic, 1572–1672" (PDF). umassd.edu. University of Massachusetts Dartmouth. Retrieved 4 June 2014. ^ a b c Israel, Jonathan I. (1998). The Dutch Republic: Its Rise, Greatness and Fall, 1477–1806. Clarendon Press. ^ Hoogmogende (superlative of the adjective mogend(e)) Heren was translated into Latin in international treaties not as potentissimos (superlative of potens) Dominos, as it should have been, but as Celsos Potentesque Dominos, and the latter wording was rendered in English as "high and mighty lords", which is still the standard translation. ^ a b c d Pot, C.W. van der; et al. (2006). Van der Pot, Handboek van het Nederlandse staatsrecht, 15th edition. Kluwer. ^ "Democracy in the Netherlands". 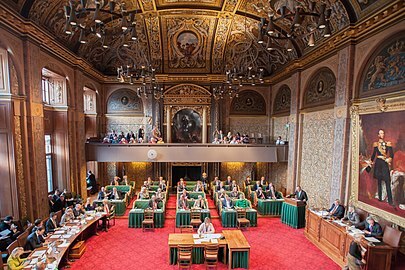 www.houseofrepresentatives.nl. April 12, 2011. ^ Laurens Kok en Jan Hoedeman (17 September 2017). "'Staatsschuld hoeft helemaal niet te worden afgelost'" (in Dutch). Algemeen Dagblad. Retrieved 10 December 2017.